Kendal is the third largest town in Cumbria and the celebrated home of Kendal Mint Cake. Until the 19th century it was important wool and weaving centre, but today tourism is the driving force of its economy. The town lies on the River Kent, on the border of the Lake District National Park. Though not part of the park itself, it is frequently promoted as its southern gateway and is only 10 miles from Windermere. Because most of the buildings in Kendal are built from grey limestone it is frequently referred to as the Auld Grey Town. Fortified alleyways, or yards, are an integral part of its layout. They were built as a refuge from the Border Reivers, gangs of Anglo-Scottish looters that brought terror to the town throughout the Middle Ages. The small town of Kirkby Lonsdale lies 13 miles to its south-east. Hotels in and around Kendal include the Riverside, Castle Green, Station Inn, and Stonecross Manor. Kendal’s 12th century castle was once home to the Barons of Kendal, most notably the Parr family whose most famous member was Katherine Parr, the sixth and last wife of Henry VIII. It is now in ruins but offers spectacular views over the town and is a great place for walks. An exhibit giving more insight into its history can be found at the Kendal Museum. Abbot Hall is a Grade I listed building built in the mid-18th century. It now houses the Abbot Hall Art Gallery and the Museum of Lakeland Life. Two major attractions just south of Kendal are Levens Hall and Sizergh Castle. Levens Hall is an Elizabethan mansion built around a 13th century pele tower. It is most famous for its topiary gardens, regarded by many as the best in the world. The Brewery Arts Centre is the main entertainment venue in the town. It features a 2-screen cinema showing all the latest releases, a theatre, and a good selection of restaurants and bars. Popular events in the area include the Kendal Mountain Festival in November and Kendal Mintfest/Lakes Alive in the summer. The Kendal Calling music festival started life in 2006 at Abbot Hall Park but is currently held at Lowther Deer Park near Penrith. Sports facilities in the town include Kendal Snowsports Club, the Lakeland Climbing Centre, and Kendal Golf Club. Kendal Leisure Centre features a 25m indoor swimming pool, gym, badminton and squash courts, and a theatre. More information and leaflets for all these attractions can be found at the Kendal Tourist Information Centre. It’s situated within the Made in Cumbria shop on Stramongate on the town centre. In 1189 Richard I granted Kendal a charter to hold a market. Today Kendal Outdoor Market is held on Wednesdays and Saturdays and features around 30 stalls selling a variety of goods. Kendal Indoor Market was built in 1887 to commemorate Queen Victoria’s Jubilee. It is open 6 days a week and adjoins the Westmorland Shopping Centre, a covered mall with around 30 high street stores. The K Village opened in 2010 and is a factory outlet mall with a good range of stores including Lakeland, Cadbury and Clarks Shoes. It’s situated on the site of the K Shoes factory, a major employer in the town until its closure in 2003. Other shopping centres in Kendal include Wainwright’s Yard (includes a Booths supermarket), Elephant Yard and Blackhall Yard. Unlike many town centres these days, Kendal boasts a fantastic selection of independent and speciality shops. Notable choices include the 1657 Chocolate House (an old fashioned chocolate shop and café), Farrer’s (tea and coffee merchants), Kirkland Books (rare and antiquarian books), and the Staff of Life (handmade breads). Kendal is situated just over the south-eastern fringe of the Lake District National Park. To reach it by car leave the M6 motorway at Junction 36, 37, 38 or 39. The town centre has a reasonable selection of car parks. The largest, with over 600 spaces, is at the Westmorland Shopping Centre. Kendal train station is located at the northern end of the town centre. It lies on the Lakes Line, a 10 mile stretch of track linking Windermere, Staveley, Burneside, Kendal, and Oxenholme. First TransPennine Express offers a service between Windermere and Manchester Airport. The train calls at Staveley, Burneside, Kendal, Oxenholme, Lancaster, Preston, Chorley, Bolton, and Manchester Oxford Road. Oxenholme train station is just a 5-minute journey from Kendal. It lies on the West Coast Mainline and offers train services to Glasgow, Edinburgh, Manchester, Birmingham, and London. For detailed train timetables and ticket prices to and from Kendal visit the National Rail Enquiries website. The closest airport is Blackpool International Airport (54 miles by road). Others include Manchester Airport (82 miles), Liverpool John Lennon (86 miles) and Leeds Bradford (65 miles). 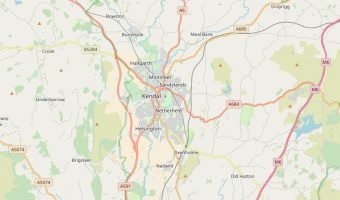 Interactive map of Kendal showing tourist attractions and more.